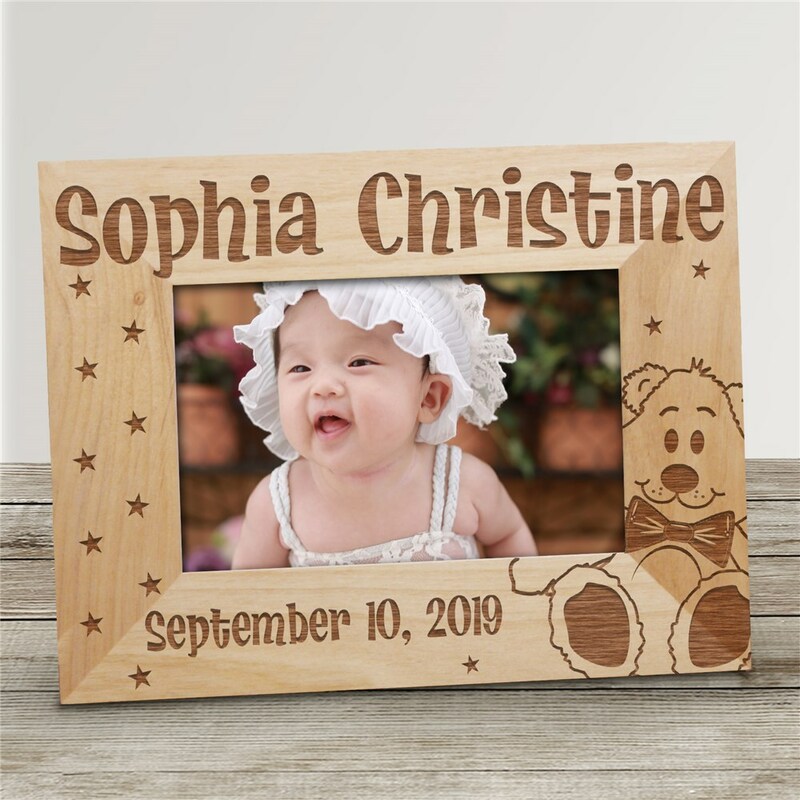 Picture frames make for great personalized baby gifts because they can give you a touching keepsake to cherish forever. Our Engraved Baby Picture Frame displays a lovely New Baby picture surrounded by the engraved name, date and cuddly teddy bear. Your entire family will absolutely love this Personalized Baby Frame as their own personalized birth announcement. Our Engraved Baby Picture Frame can be personalized with any child's name and date. Engraved Baby Picture Frame comes in three sizes, please choose from, 4"x6, 5"x7" and 8"x10". Easel back allows for desk display. Includes FREE Personalization! Love the picture frame. Very sturdy and the design on the frame is adorable. Product came on time. Was just as beautiful as pictured. Sturdy. I was so happy to find a frame for an 8x10 photo I could personalize. I had a collage of my fourth granddaughter’s newborn to one year photos so was able to personalize to reflect that. Extremely satisfied! And very reasonable too! Looking for the best Engraved Picture Frames? GiftsForYouNow.com offers personalized picture frames, graduation picture frames, baby picture frames, wedding picture frames, custom picture frames and photo frames for every occasion or gift recipient. Be sure to look at our entire collection of Personalized Baby Apparel. Our Personalized Baby Apparel section has everything you need to outfit your infant, toddler or child in custom printed attire.